My A/C has been out for weeks and it doesn’t cool down much at night in the Florida mid-summer. I have been testing myself to see how long I can keep at this game (and the energy savings have been huge). Temps inside my house have been creeping steadily upward and currently the house is a toasty 87F (30.55 C) and it’s midnight. Funny thing is, I’m heat-adapted and perfectly fine sleeping with just a pair of box fans to keep the air moving. However, the heat and humidity is finally taking a toll. My tents, jackets, and other expensive gear have started to delaminate and fail due to heat and humidity, so I’m off to get a new A/C compressor fan motor tomorrow. 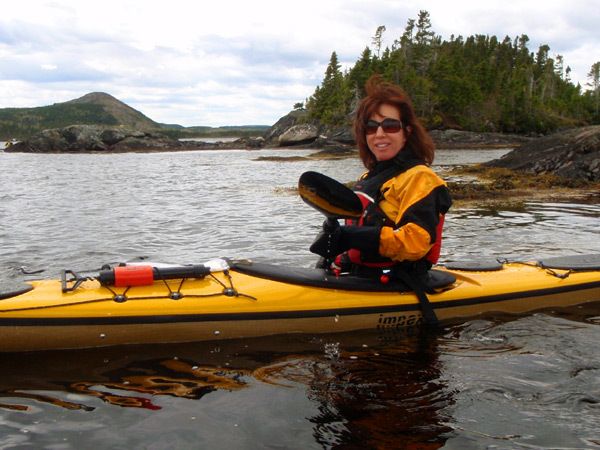 I just returned from a whirlwind trip — teaching and speaking at the Atlantic Canadian Paddling Symposium in Nova Scotia before rushing off to Newfoundland to teach at the annual Kayak Labrador and Newfoundland (KNL) symposium. This isn’t as crazy as it sounds — next year the Atlantic Canadian Symposium will be held in Newfoundland (in lieu of the KNL event). I should be accustomed to it by now, but it still feels silly to pack a suitcase full of winter clothes and gear, including a drysuit, and heavy wool insulation, when the mercury outside my Florida home is topping at a sweltering 90 degrees (32 C). I first experienced this disparity in 2000 when I traveled in summer to Greenland to compete in the 2000 championship. Flying from Baffin to Greenland I was shocked into reality as I gazed at the brilliant ice pans below that glistened in the sun. A chill went through me. “You’re not in Kansas any more”. Now, Newfoundland and Nova Scotia aren’t as cold as Greenland, but it did snow briefly in Newfoundland when I arrived!